Dental disease, also known as ‘tooth and gum disease’ is one of the most common problems in cats and dogs, but it often goes undetected. Over time, layers of bacteria and food particles collect on your pet’s teeth, forming ‘tartar’. When tartar calcifies, this then becomes ‘plaque’, which irritates and causes infection in the gums (gingivitis) and if left untreated, can lead to periodontitis. Periodontitis is where the infection reaches the tooth’s roots and damages the ligaments and bones that support the tooth. Eventually the gum and roots loose their integrity and tooth loss occurs. Bacteria can also enter the bloodstream and cause other problems including heart and kidney disease. What are the signs of tooth and gum disease? Yellow or brown stains on the teeth (tartar), particularly around the back molars. Reluctance to eat or difficulty eating. 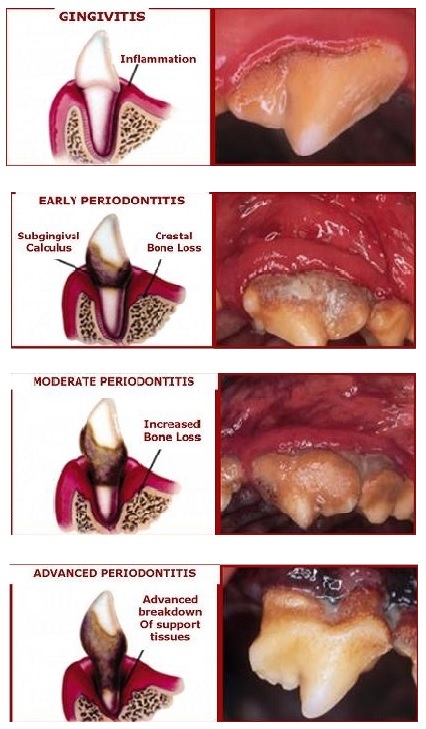 The severity of periodontal disease is generally graded on a scale of 4. Grade 2 (Early Periodontitis): Moderate tartar and gingivitis, with build up extending further into pockets. Gums may start to recede. Pockets are 2-4mm. At this stage the disease is reversible with veterinary treatment and cleaning, provided action is taken immediately. Grade 3 (Moderate Periodontitis): Marked tartar, gingivitis and smelly breath. Beginnings of periodontal disease with bright red ulcerated gums. Pocket depth is between 4-8mm. The mouth will be sore and eating behavior may change. This stage of periodontal disease can be irreversible. Extractions are typically required. Grade 4 (Advanced Periodontitis): Severe gingivitis, and tartar with odorous breath. Gums have receded extensively due to chronic infection. Severe bone loss and tooth may be loose. At this stage, your pet is at risk of becoming extremely ill should bacteria get into their bloodstream.